Can you believe that once upon a time my children did not believe me that leaves actually changed color? We read books and I showed them pictures. Still, they were not convinced. Why? We lived in south Texas where the leaves really didn’t change color. Leaves stayed on the trees year-round and winter was only a few brief days of sweater weather. Gorgeous fall foliage was a thing that existed only in books, but never in real life. Fast forward to today: Now they believe me! We moved up north and we get to enjoy all 4 seasons. Autumn is one of our favorite times – we marvel at the beautifully colored leaves and we enjoy the crunching sounds when they fall under our feet. 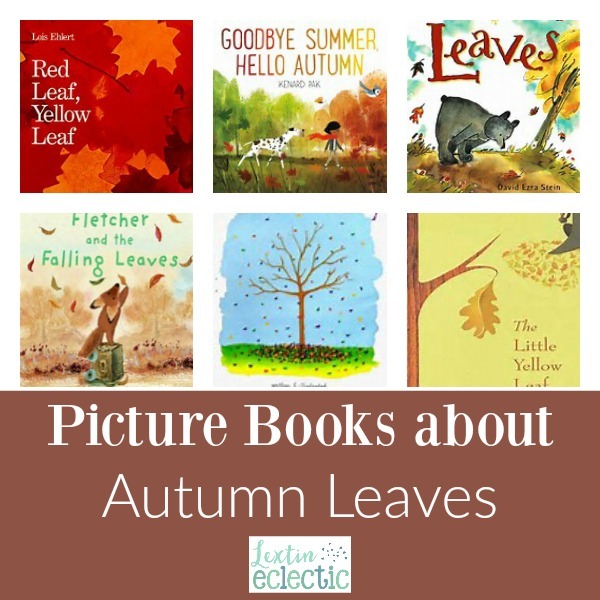 Whether you get to experience the change of seasons in books or in real life, here are some wonderful books about autumn leaves to get you ready for fall! Follow Ginger as she enjoys the autumn snowflakes in the form of beautiful fall leaves. And there is a unique search and find challenge in this book as well! Learn the science behind the changing of the leaves from green to gold, red, orange, and yellow. This beautiful book has illustrations made from autumn leaves. Follow the leaf man as he is blown about by the fall winds. Fletcher the fox is very worried as the leaves begin to fall from the trees. But he soon gets a welcome surprise! Join 3 friends on this sing-song journey to find autumn leaves. This board book is the simple and charming story of a bear’s first autumn. As the other leaves float past, the little yellow leaf isn’t quite ready to say goodbye to the branch and flutter in the autumn wind. Learn facts about trees and leaves in this beautifully illustrated watercolor picture book. This poor tree has a terrible time with its leaves changing colors. It just can’t seem to get it right. Read about the changes a maple tree undergoes in the various seasons. Join a young girl as she walks through town and sees all the evidence of the changing of seasons. Leaves blanket the earth and crows raise their voices to the sky in this celebration of autumn. Follow the journey of one tree from summer until winter, seeing the autumn changes. Celebrate autumn with this short and simple book about the change of seasons. And if you’d like more book lists, be sure to check out these posts! I am in AZ where we don’t really have all four seasons so I will definitely need to check these out for the babes. These all look so great! I’ll have to read some of these with my daughter! This is such a great round up of books! I have read many of these, but some are new, so I will have to check them out! As a teacher and mom in a state where we do not see the changing of the seasons, these are are great resources for building background knowledge. There are some really great books on the list! I relied heavily on these books when we lived in a warm climate with no change of weather. Now we can finally see the changing of seasons, but of course, the books are still fun! Leaf man looks so cute…well, really they all do! That is so cute, but I understand why they wouldn’t get it- no schema! I’ve read Red Leaf Yellow Leaf, but many of here are new to me. I’ll definitely check them out for my munchkin!